Hummingbird is the name of Google's new search algorithm (how Google searches the web), its largest update in a number of years. It was announced last month, but it has been running for a few months now. It is a major step in Google's work toward making the Internet a more user-friendly experience. 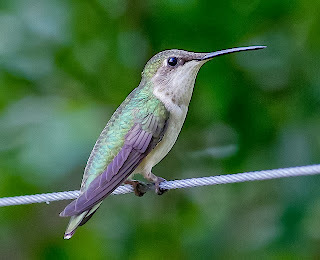 Hummingbird is part of the "semantic web" movement, which basically seeks to make the Internet more human by inferring meaning and purpose from information and searches on the web. So instead of looking at site or search query as a series of words and numbers, the semantic web focuses on 'what is the purpose of the site/page?' or 'what information is the user trying to find?' This is especially critical now that voice searches over mobile devices are becoming more and more popular. Since search is so critical to Google, their algorithms are secret, but they have discussed some of the factors that Hummingbird takes into account. The sentence structures of search queries are better evaluated to determine meaning, instead of focusing primarily on keywords. There is also greater emphasis on common programming syntax, like Schema.org schemas, to describe the type of information on websites. What does Hummingbird mean for Small Business and Local SEO? Having a clear and logical website design that is easier for users to read and navigate. This will also help search engines understand the purpose and information on your site. Providing specific informative content for users, including detailed descriptions, articles/blog posts, FAQs (frequently asked questions), tips, etc. can help answers the questions searchers are looking for. Having great content also encourages people to link to your site as a trusted and authoritative source. Interacting with customers on social media, responding to reviews, and maintaining correct and uniform directory listings all still play major roles in building your web presence and business' brand. We are focusing on what is new about Hummingbird, but Hummingbird did not erase the search algorithms that came before it. Rather, it built upon that foundation, striving to create an Internet and world that provides a better user-friendly, customer-oriented experience. This too should be the goal of our online and general business strategy. 온라인 마케팅 수단으로 이용할 수 있는 소셜 미디어의 종류는 대단히 많다. 우리가 익히 들어 잘 알고 있는 페이스북, 트위터, 유튜브 등은 소셜 미디어의 극히 일부분에 불과하다. 그래서 소셜 미디어들의 종류와 특성 그리고 마케팅 이용 방법 등을 모두 이해하기란 쉬운 일이 아니다. 소셜 미디어를 구분하는 방법은 여러가지가 있지만 독자들의 이해를 높이기 위해 네트워킹(Networking), 블로깅(Blogging), 미디어공유(Media Sharing), 온라인 디렉토리(Online Directory) 네가지로 구분해서 3회에 걸쳐 설명해 보려고 한다. 페이스북(Facebook)과 트위터(Twitter), 링크드인(LinkedIn), 구글 플러스(Google +)는 대표적인 네트워킹 사이트이다. 네트워킹은 비즈니스와 고객 사이의 소통을 위한 도구라고 볼 수 있다. 비즈니스 정보나 기타 다른 유용한 소식들을 고객들에게 제공하고 고객들의 의견을 수렴하며 고객층을 확장시키기 위한 도구로 쓰여진다. 네트워킹 소셜 미디어를 비즈니스의 입장에서 간단하게 정의하면 고객 및 인맥 관리 및 확장을 위한 소셜미디어라고 설명할 수 있다. 페이스북의 Fan, 트위터의 Follower, 링크드인의 Connection, 구글 플러스의 Follower 등은 모두 특정 비즈니스의 고객 혹은 인맥 네트워크를 설명하는 용어들이다. 따라서 페이스북의 Fan(likes)과 트위터의 Follower, 링크드인의 Connection , 구글플러스의 Follower숫자가 많을 수록 일반적으로 온라인 마케팅의 효과는 높다. 그렇기 때문에 많은 비즈니스들이 이 숫자들을 늘리기 위해 프로모션과 광고 등 다양한 방법을 이용해 노력을 기울이게 된다. 페이스북은 소셜 미디어 중에 가장 널리 이용되는 수단이다. 비즈니스는 페이스북을 통해 비즈니스 소개는 물론 상품, 서비스 정보를 제공할 수 있을 뿐 아니라 다양한 어플리케이션과 광고를 통해 마케팅 효과를 높일 수 있다. 특히 지역과 연령, 혹은 언어별로 특정한 집단 만을 겨냥한 광고 마케팅이 가능해 저비용 고효율의 마케팅 효과를 기대할 수 있다. 트위터는 페이스북에 이어 두번째로 널리 이용되는 소셜 미디어 수단이다. 특히 젋은층의 선호도가 높다. 트위터는 온라인 상에서 편하고 간단하게 친구 혹은 고객들과 소통하는 수단이다. 트위터는 사용이 대단히 간단한 반면 한번 글을 올릴 때 글자수가 제한되어 있고 페이스북에 비해 기능이 다양하지 않다. 하지만 링크 기능을 이용해 페이스북이나 웹사이트와 연동할 수 있고 많은 사람들과 정보를 간편하게 공유할 수 있다. 링크드인은 전문가 집단에서 널리 쓰이는 네트워킹 수단이다. 학력과 경력 그리고 현재 직장 혹은 비즈니스에서 하는 일들을 구체적으로 공개하고 이와 관련된 사람들끼리 네트워크를 형성하는데 링크드인의 주 목적이 있다. 부동산 에이전트를 예로 들면 다른 부동산 에이전트는 물론 융자, 은행, 건설회사, 투자회사, 변호사, 리모델링 및 수리 전문가 등 업무와 관련되는 다른 전문가들과 링크드인을 통해 교류할 수 있다. 구글 플러스는 페이스북과 비슷한 기능을 가지고 있다고 이해하면 쉽다. 페이스북에 비해 후발주자라는 핸디캡이 있지만 강력한 구글의 다른 서비스들 - Gmail, Google Search 등 - 과 연동해 효과를 극대화시킬 수 있다는 장점이 있다. 또한 구글 플러스는 네트워킹과 동시에 온라인 디렉토리의 기능도 함께 가지고 있다는 특징이 있다.